We picked up our belongings and then went back to Heishui for a late lunch. The best course of action seemed to be to get a ride to Hongyuan, up on the Tibetan plateau. It was about 180 km away, and we found a guy with a pickup truck who agreed to take us for 500 RMB. We arrived as it was getting dark and scoured the town for a suitable hotel, settling on one for 80 RMB per room with internet. The next day as cold in the morning and cycling we had to wear gloves (or in my case socks over my hands). But we had a great tail wind which blew us north 50 km in a few hours. We stopped for lunch and then turned east toward the next confluence point near the town of Sedi. When we got nearly there, James had trouble with his rear tire, so Peege and Kara went ahead. James and I struggled with it for more than an hour due to problems with the pump. We thought it was another puncture from a sharp rim, but in fact it was a small staple. When we met up with Peege and Kara, they had already made acquaintances with the locals and one had a guest house. However, the room was dirty and expensive, so we opted to try and find another. While checking out another place, a home stay, the police came to see us. We were invited back to the police station for a chat and they gave us yak tea and noodles to eat while they decided what to do with us. Since we arrived by bicycle, we couldn't leave for another town that day, so they let us stay at the home stay. At night the dogs came out and barked right under our window, so James and I didn't sleep a wink. Peege and Kara on the other hand didn't hear a thing and were looking refreshed and ready to go at 8 AM. We left the bikes in the police station "for safety" and we went back to collect them with little fanfare. We had breakfast and then cruised out to the highway. I knew we were within a few kilometers the confluence point, and when we left town I checked the GPS. It was much closer than I thought! We were wondering if we would be followed, but I think they were as glad to get rid of us as we were them. Once on the highway we rode until the arrow pointed 90 degrees. 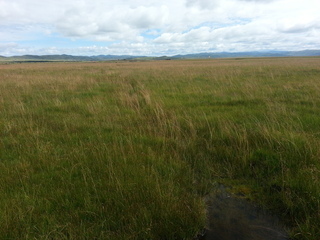 It was about 1.3 km and the confluence point was visible from the road in plain with yaks and yurts. We walked the bikes through the the mine field of yak poop and small ravines about half way and then abandoned them in a heap to walk the rest of the way unencumbered. As we neared one of the yurts a Tibetan on a motorcycle came up to us and asked what we were doing. I told him we were going for a walk. He shrugged and sped off. We were visible to people on the road and a few times vehicles stopped and people got out, but to our relief, no one came. After crossing multiple ravines, streams, and fences we arrived at the confluence point. It was a bit anticlimactic. We did the GPS zero dance, took photos and had a minor celebration. We returned to the bikes and painfully pushed them back to the road and cycled on. At 3800 meters (12,500 ft), the air was thin and our legs weary. We cycled over a few more hills and everyone's thoughts were on when we can finally get off this damn plateau. About three or four hills later, we cruised down a hill and spotted some yurts nearby the road. We stopped for water and to hopefully a few snacks. Our Tibetan host was a large man with an easy smile and smooth style. We bought the water and were sitting on the grass when he offered to let us sit on his carpet, which we gratefully accepted. As we rested, he then set up an umbrella and brought out some Tibetan milk tea. As we were exhausted, we again gratefully accepted. Next he said he had some food, and James got a bowl of rice with yak meat. He then said he could sit in the glass tent with cushions and tables, so we moved in there. This was pure heaven. Warm, comfortable, great views, and thoughts of getting back on the bikes were fading away. We had an extra day, so there was no rush. We discussed the situation; Staying here was easy, comfortable and we could still get back in time, so why not? We spent the rest of the day chatting with the parade of young Tibetan men who came by to check us out. We went horseback riding through the yak fields, threw around the rugby ball with the Tibetans, drank tea, ate noodles, danced, drank some beer, and generally goofed off. It was a great way to celebrate bagging the confluence point. The next day we painfully mounted the bikes again. I put all of Peege's gear on my bike to make it easier for her to get up the hills. Our host said we had three more hills to climb before we left the high plateau and headed back down to the Sichuan Basin. The hills were very long, but at long last we got the top of the last one where a small town of roadside shops had setup business. Then we began the long anticipated 40 km ride downhill to Chuanzhuzi. But there was a surprising 8 km climbing in the middle. We arrived in Chuanzhuzi, went to the bus station to check on tickets to Chengdu the next day, and decided to go to Songpan, a picturesque town and got a NICE hotel worth plenty of hot water followed by a great dinner. The 8-hour bus ride back to Chengdu the next day was lengthened by 2 hours due to a landslide. All in all a marvelous trip.